Home>Kitchen & Bath>Stone Lining > Noce Base Board 5"x3/4"x12"
Noce Base Board 4"x3/4"x12" is a travertine stone lining that has simple but elegant patterns. It is light brown in color. Its texture is very smooth and shiny. Noce Base Board 4"x3/4"x12" is a material that is known for its beauty and practicality. It is available in different sets of design and available at a cheaper price. It is very easy to install and to maintain. It is very durable and can retain its appearance after a long period of time. Noce Base Board 5"x3/4"x12" carries the aspect of versatility since it is great for any indoor or outdoor edges or linings. It is amazing when installed in areas like in the living room, kitchen or garden. 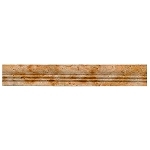 Noce Base Board 5"x3/4"x12" provides a unique result when combined with colors like white, brown, cream, and ivory. It is perfectly great when matched with tiles that are made out of travertine and marble. 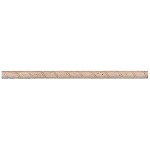 Gold Ogee 2 Step 2 1/2"x1 1/2"x12"